We commonly concentrate on finding that perfect product and perfecting our style technique. 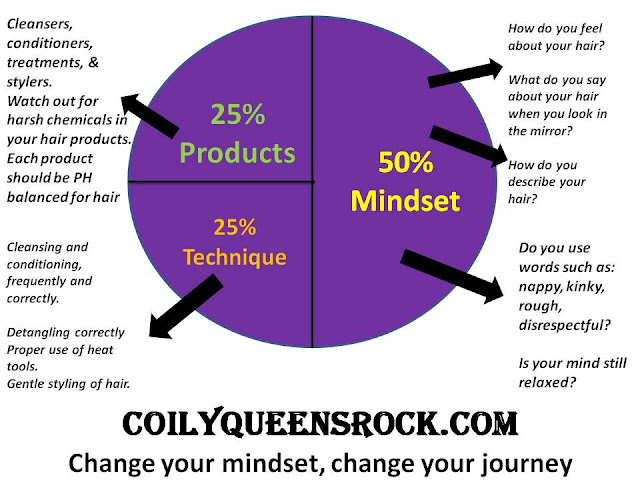 But we spend little time on dealing with our mindset concerning our natural tresses. 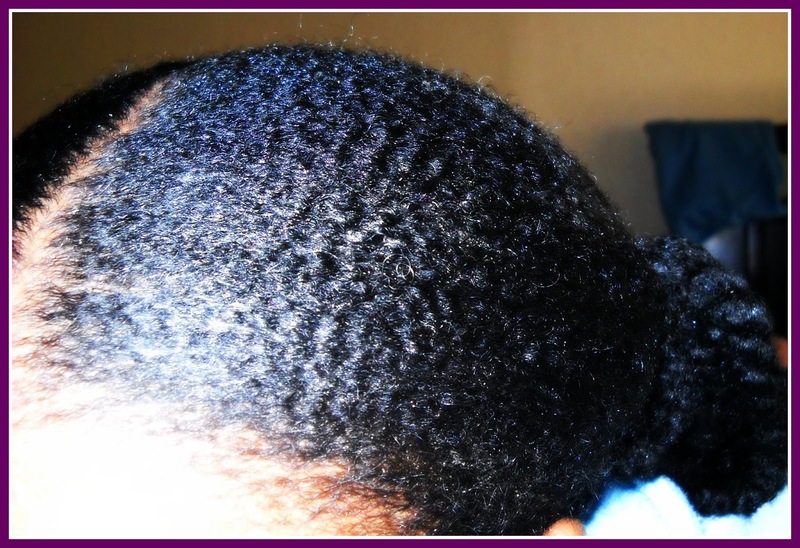 This is one of the biggest mistakes some women make when returning back to their natural hair. For most it is discovering their natural curls for the first time. I divide the hair journey into 3 parts. It is 25% the products you use, 25% the techniques you use and 50% your mindset towards your hair. One can see how not addressing such a huge part of your journey can be hindering. Not being honest about how your truly feel about your hair many times leads to setbacks. Either the person returns back to the relaxer, continuously rocks fake hair or they experience breakage from bad hair care practices. Below are some very common negative mindsets black women have towards their hair. Along side each negative mindset I offer some solutions for you. I want you to have the hair you desire, minus the setbacks. Therefore I offer help via some solutions I have seen help ladies tremendously. "After going natural for a year, I hate my curl pattern"
Be sure you are seeing your true curl pattern. Until your hair is hydrated, consistently you will not see your real curl pattern. Work on your hydration. Be sure you are following a consistent healthy regimen. If you are continuously rocking fake hair, that will mess up your hydration. Thus lay off the fake hair until your hair is healthier hydration wise. Take a 7 months break from fake hair. "I do not like how I look with short hair and my hair appears to grow slow." Examine your cleansing regimen. How often are you cleansing your hair? Are you following a consistent healthy hair care regimen with natural products? Have you measured how much your hair grows each month? Is your shrinkage blinding you to how much your hair is actually growing? For some motivation set your hair on magnetic rollers, for a nice stretch. Are you breaking your hair off by doing bad hair care practices? Sometimes you need extra help. Sign up for hair growth coaching and start growing the hair you desire. "I cannot get past the amount of shrinkage I have. " Want less shrinkage use less product. After day two of your style, stop applying any type of water or water based product on your hair. Stretch your hair using magnetic rollers, before you create your styles. Allow your hair to air dry, 70% while in big twists. 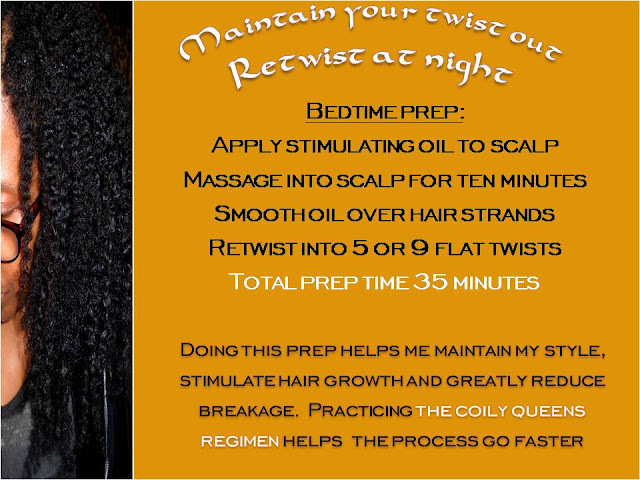 Then set your twist out, on 70% air dried hair. You will have more elongated styles. "I love my hair but it takes so long to achieve styles I love." Perhaps it takes you a long time due to tangles. If this is the issue then work on your hydration to reduce your tangles. Do lots of pre poo treatments to combat excessive tangles. Re-evaluate the styles your are trying to achieve. Work consistently perfecting one style. Afro hair is like memory foam, the more you mold it into the same shape, the easier it molds. Examine areas of your style regimen in which you are making them more lengthy than they need to be. After I spend hours creating a style, it frizzes up so quickly. So I rather wear fake hair, it is easier. Pay attention to the weather. Do not try to compete with mother nature, most likely you will lose. On high humidity days or misty days, wear your hair in a puff, bun, ponytail or roll tuck and pin. Invest in some anti humectants. Anti humectants contain ingredients which help the hair to hold its style longer by blocking out the humidity. Pomades do this very well. Get use to how your frizzy shrunken hair looks. Fall in love with the truly natural you. TRANSFORM YOUR MINDSET TAKE THE 30 DAY CHALLENGE. CHALLENGE A: Rock your hair in it's shrunken undefined state for a whole day. Be sure to leave the house. 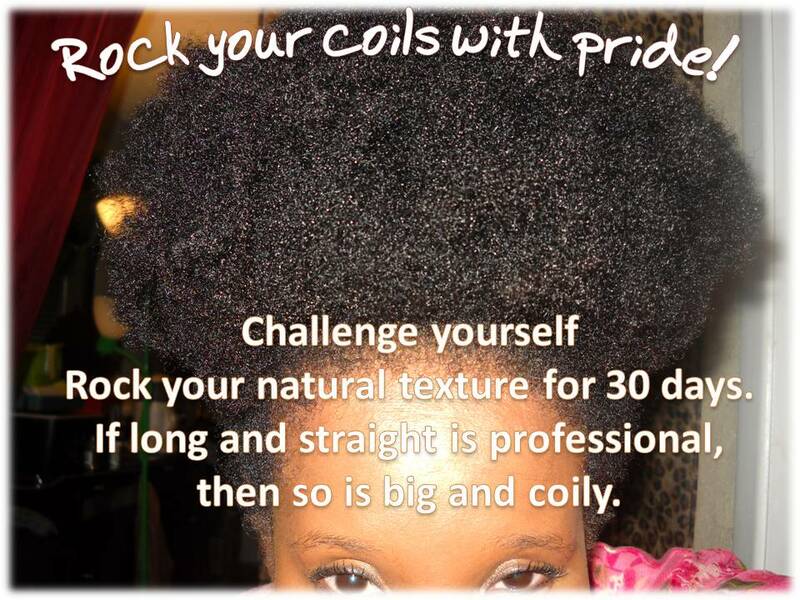 This experience is liberating for those who do not normally wear their hair in its Afro state. CHALLENGE B: Rock your natural texture for 30 days. Make journal entries as to how you feel about your hair experience. It will transform how you see your hair. Concentrate on how you feel not what you think other people are thinking.